When something goes awry with your health, it usually sends you straight to the drugstore—or worse, to your doctor. But what if we told you the fast track to mental and physical wellness (not to mention great skin) is inside a drop of essential oil? It’s true. And if you are done dealing with the pharmacy for every little ache and pain, you’d be wise to stock your medicine cabinet with these natural alternatives. Why go au naturale? 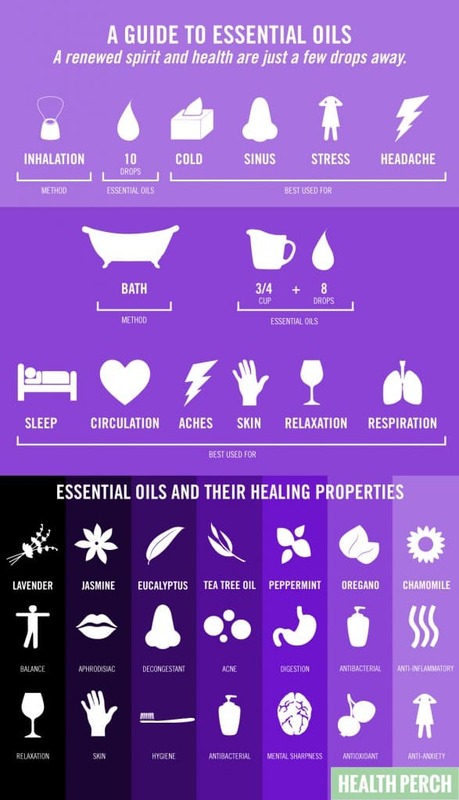 On a chemical level, essential oils are made to heal. With small molecular size, essential oils penetrate the skin easier and faster, delivering the healing properties where and when you need them most. (And when you’re using essential oils as a remedy for a headache, cold, or even stress, speed is key.) Research shows certain oils have the ability to affect the central nervous system—meaning they have the power to lower blood pressure, calm you down, or give you an afternoon energy boost. 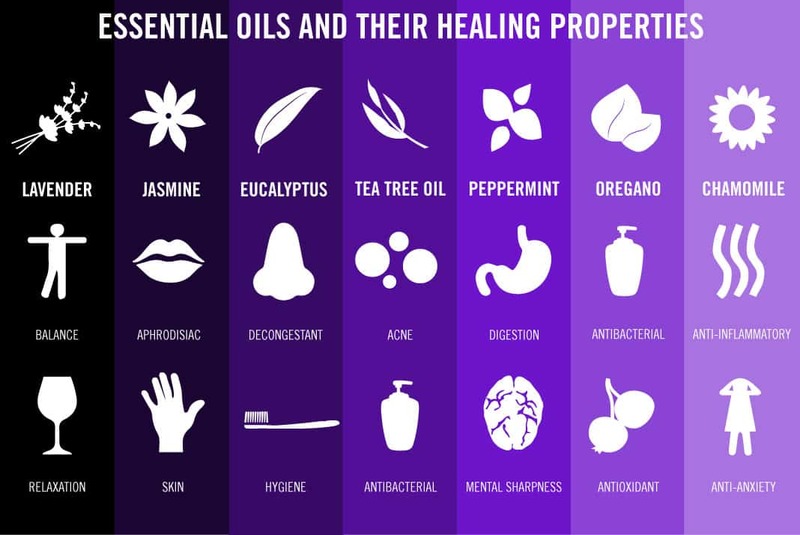 And as more and more of you considering a more alternative route to good health, the ease and simplicity of essential oils contribute to the growing trend. Inhalations through a hot compress, diffuser, or hot water facial steams. This method uses about 10 drops and is best for colds, sinus problems, headaches, and stress relief. In the bath to create the ultimate healing retreat without leaving your home. Be sure to mix essential oils (8 drops) with an emulsifier like soothing salts or a carrier oil like coconut or sesame (3/4 of a cup). Without it, the oils won’t disperse evenly. Best for muscle aches, skin issues, circulatory and respiratory health, sleep issues, and relaxation. 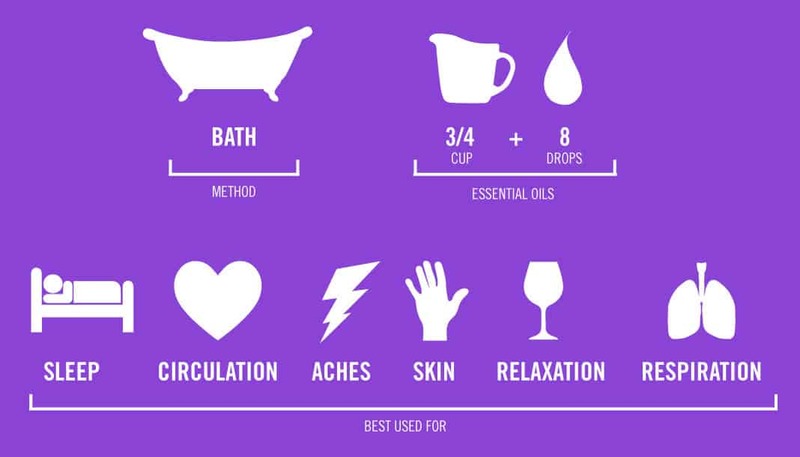 Massages with a 2.5% concentration of essential oils is a classic way to relieve muscle tension and relax. Palm Inhalation should only be used with oils that can be tolerated on the skin. Rub two drops of a healing antimicrobial oil between palms and inhale to clear out sinuses and distress. For as easy as they are to apply, it’s not as simple to spot a fake. Try the ring test. Place a single drop of your new oil on white printer paper and let dry. If there’s an oily ring left behind, it’s not a pure essential oil. Exceptions: heavier, darker oils like sandalwood, vetiver and patchouli. Check the label Look for a bottle that includes the plant’s Latin name on the label. Note the packaging Plastic won’t cut it here, due to the strong compounds in pure essential oils that can break it down. Look for a glass bottle that’s dark or amber colored—it helps protect against oil-degrading ultraviolet light. Go organic To be sure you aren’t inadvertently exposed to pesticides, look for the USDA organic seal, or the term wild-crafted on the label. There’s little this popular scent can’t do for you. The therapeutic-grade oil goes to good use in beauty products and it’s an expert balancer, perfect for relaxing and winding down before bedtime. Most recently, research shows Lavender to have more medical uses than ever thought before: New York University doctors exposed some patients undergoing gastric bypass surgery to lavender oil through their anesthesiology facemasks. The ones breathing lavender during their surgery required significantly less morphine after surgery! If a whiff of this wistful scent makes you feel warm and fuzzy inside, it’s not by chance. Jasmine is a known aphrodisiac, and is often used to spark romance or treat sexual disorders. It’s also been shown to fade scars and dark spots, fight depression, and act as an antiseptic or disinfectant. When you are stuffed up, eucalyptus is your best friend. This natural decongestant is known to soothe respiratory problems. Add a few drops into your humidifier’s reservoir to keep germs away and help you breathe easily, or inhale some from a hot compress to disinfect the nasal passages and lungs. Skip the bottle of hydrogen peroxide and grab some tea tree oil instead—this is a proven antiviral and antibacterial that, when mixed with a carrier oil like coconut oil or aloe vera gel, can treat cuts, bug bites, warts, fungal infections and even acne. Use it to clean your countertops, too! Harness the cooling powers of peppermint on a hot summer day by mixing a few drops in with carrier oil and apply anywhere that needs it. Peppermint is also key for anyone who suffers from stomach issues: not only is it a years-old remedy for nausea, but newer research shows peppermint can treat the symptoms of IBS like pain, bloating, gas, and diarrhea. Take a whiff if you’re feeling light-headed, too. If you’ve only ever spoken about oregano in relation to your pizza, consider this the start of a beautiful relationship. Oregano is actually a proven antibacterial, and its antioxidant properties are perfect for fighting sinus infections. You can even use the pure stuff in your food! Chamomile isn’t all sleepytime—German chamomile is actually a powerful anti-inflammatory. If inflammatory responses are high for too long, it can cause chronic inflammation, which has been associated with everything from joint pain to depression to cancer. German chamomile helps regulate it. Another win: if you’re having an anxiety attack, put a drop of this oil in each hand and breathe in.